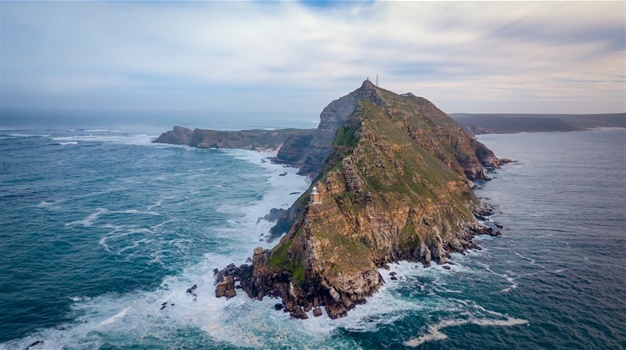 While the beaches are undoubtedly gorgeous - the temperatures along the Atlantic coast are not always favourable to some. The crowds and traffic jams on route to the Indian Ocean beaches often just leave you to die a slow, sweaty, death in your car. Fret not, as South Africa has a great selection of different pools (both natural and otherwise) to cool you off as you soak up the scenery. Summer beckons, are you ready for it? Lounge in the sun in this rim-flow pool at Jozini Tiger Lodge. Overlooking Lake Jozini with extended views of the Lebombo Mountains in the heart of Zululand, this is a great place to cool out and do enjoy a heavy dose of chill. Admission: Day patrons are welcome. Contact: 035 5721 020. Follow this link for more information. Put on your swimwear and get salted in the warm waters of the Indian Ocean at the tidal pol at Salt Rock beach. Look out onto the calming waves of the ocean and feel the waves of tranquillity wash over you. Contact: The Salt Rock Hotel 032 525 5025. Follow this link for more information. The bush and views by the pool? Entirely possible! The private plunge pools at Jackalberry Ridge are the best way to watch the sun set in the bush and take in all that natural scenery after a long day spent game viewing. With the Kruger National Park right on your doorstep, this is an ideal family getaway. Admission: Book an overnight stay. Contact: 0861 010 347. Follow this link for more information. 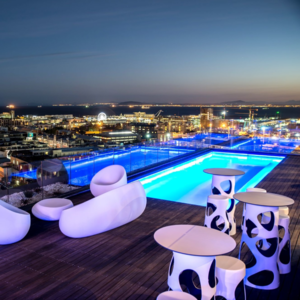 More than just a bar, this rooftop sun terrace and pool deck boasts killer views – of the sea and Table Mountain – making it the perfect place for sunset cocktails. Cool out, check out the views and snap a pic or seven for the gram - this place looks great. Contact: 087 086 1578, baxter@radissonred.com. Follow this link for more information. Seeking sundowners with a view in the city? Look no further than the San Deck Bar and Restaurant. With a great pool to cool down in and hang around, this is the perfect place to cool down and appreciate the views after a long day's hustle. With trendy décor, comfy wicker chairs and large fire pits, it’s especially great for sunset cocktails with those incredible panoramic views of the Highveld beyond the city skyline. Admission: Day visitors are welcome from 09:00 until 22:30. Contact: 011 780 5000. Follow this link for more information. Many a memory has been made at the Seapoint Pavillion outdoor pools. Picture ice cream, housewives running with their dogs and senior citizens coming out for a wholesome viewing of the sun setting. Offering easy access and an incredible seaside view that stretches over the Atlantic, make sure to stop by and find your chill. Admission: Open 07:00 until 19:00. Cost is R23 per adult and R12 per child. Entry is free for pensioners. Contact: 042 281 1607. Follow this link for more information. Escape the bustle of the city and enjoy panoramic views of the Cederberg Mountain at the shimmering outdoor pool at Piekenierskloof Mountain Lodge. This elegant rooftop venue provides spectacular panoramic views over and beyond the city. The large open-air deck makes the most of the location on the top floor of the new Mirage building in De Waterkant and its pool is endlessly inviting. Contact: 021 418 3065, info@the-vue.com. Follow this link for more information. one of the most famous hiking trails is also host to one of the most inviting freshwater rock pools in the country. Offering amazing views such as a waterfall and afromontane flora, take a moment to take a dip and chill out in the rock pool on the Otter Trail. Admission: R54 conservation fee for day hikers. Contact South African National Parks for details about overnight accommodation in the park and on the trail. Contact: SANParks: 042 281 1607. Or dial 012 428 9111 for info on trail bookings. Follow this link for more information.